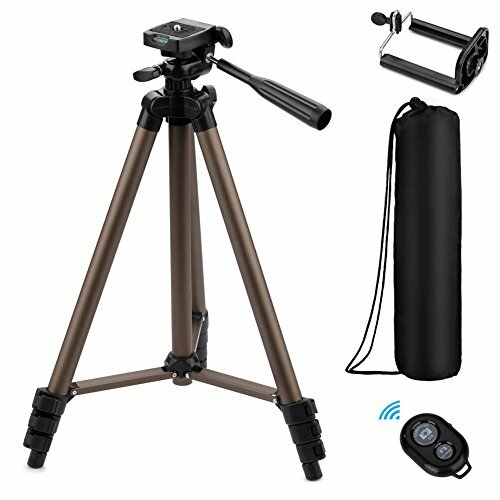 - Adjustable-height tripod, three extendable sections, makes it easy to achieve reliable stability and catch just the right angle when going after that award-winning shot. The leg height can be individually adjusted as needed or all three legs can be raised to the full height of 50 inches. - 3-way pan head, allows for ultimate versatility. Easily change the orientation of the camera from portrait to landscape. The tripod's easy-release mounting plate helps ensure fast transitions between shots and makes it easy to remove your camera from the tripod. Made of strong lightweight aluminum, easily transport from one spot to another. The tripod offers a collapsible design where the handle rotates down, the legs contract, and everything folds in a compact size. The tripod fits neatly into the provided zippered bag for easy portability and safe storage. Eocean 30 Days Money Back, One Year Guarantee and Friendly, Easy-to-reach Support. LIGHTWEIGHT AND COMPACT: Weighs just over a pound. Extends to 22", 30", 40" and 50". Minimum Height: 16". Carrying case included. UNIVERSAL CELLPHONE HOLDER: Easy attachment & padded grip to avoid cellphone damage / Adjustable phone adapter fits all phone with a maximum stretch width of 3.4". LEVEL INDICATOR: Built-in bubble view levels and 3-way head to allow for tilt and swivel motion; portrait or landscape options. WIDELY COMPATIBLE: Compatible with most video cameras, digital cameras, still cameras, projector, GoPro devices, smart phone adapters (not included), and scopes. If you have any questions about this product by Eocean, contact us by completing and submitting the form below. If you are looking for a specif part number, please include it with your message.